The March for Science was eerily religious. Our culture’s understanding of science is very, very broken, and on Saturday, it was impossible to ignore. Activists and protesters march to City Hall during the March for Science in Los Angeles, California, on Saturday. But here’s the problem: Little of what I observed dissuades me from my baseline belief that, even among the sanctimonious elite who want to own science (and pwn anyone who questions it), most people have no idea how science actually works. The scientific method itself is already under constant attack from within the scientific community itself and is ceaselessly undermined by its so-called supporters, including during marches like those on Saturday. In the long run, such demonstrations will do little to resolve the myriad problems science faces and instead could continue to undermine our efforts to use science accurately and productively. But there is very little indication that what happened on Saturday will counter these misconceptions. Instead, the march revealed the glaring dissonance of opposing that trough of ignorance by instead accepting a cringe-worthy hive-mind mentality that celebrates Science as a vague but wonderful entity, what Richard Feynman called “cargo cult science.” There was an uncomfortable dronelike fealty to the concept—an oxymoronic faith that information presented and packaged to us as Science need not be further scrutinized before being smugly celebrated en masse. That is not intellectually rigorous thought—instead, it’s another kind of religion, and it is perhaps as terrifying as the thing it is trying to fight. Of course, the quality of most peer-review research is somewhere between bad and unfair to the pixels that gave their lives to display it. Just this past week, a study published by the world’s most prestigious stroke research journal (Stroke), made headlines and achieved media virality by claiming a correlation between increased diet soda consumption and strokes and dementia. Oh, by the way, the authors didn’t control for body mass index, even though, unsurprisingly, people who have the highest BMIs had the most strokes. An earlier study that no one seems to remember showed a correlation of around the same magnitude between obesity and strokes alone. But, who cares, right? Ban diet sodas now! Science says they’re linked to strokes and dementia! By the way, Science used to say that diet sodas cause cancer. But Science was, perish the thought, wrong. This leads to the other “big bad” in science research and, therefore, a widespread misunderstanding of science by the lay pseudo-intellectual community: allegiance to the all-mighty p-value. One sign I saw at a March for Science rally was the somewhat creepy inducement to “Show me your p-value!” The popular understanding of the low p-value (the common cutoff being less than 0.05) is that the data attached to it must be true. That’s a false understanding. The p-value actually means that the data in question has less than a 5 percent chance of being the result of chance if the underlying experimental null hypothesis is true. If you don’t know what that means, don’t refer to p-values. Further, a great number of studies have basically been manufactured simply by querying large data sets with a high number of possibly relevant questions. By the math of it, around 1 in 20 of these questions will yield a positive result that can be published. This happens approximately all of the time. And the p-value isn’t the whole story. There are a dozen other statistical games that researchers can play to get statistical significance. Such ruses do not rise to anything approaching clinical relevance. Nevertheless, fun truthy ones like the diet soda study grab headlines and often end up changing human behaviors. Of course, the journals themselves have suffered because their contributors know the game. There are now dozens of stories of phony research passing muster in peer-review journals, despite being intentionally badly written. These somewhat cynical, though hilarious, exposés have largely focused on outing predatory journals that charge authors money in exchange for publication (assuming the article is “accepted” by the rigorous peer-review process; the word rigorous, by the way, now means “the credit card payment went through and your email address didn’t bounce”). But even prestigious journals have been bamboozled. The Lancet famously published fabrications linking vaccines and autism in 1998. and it took 12 years to retract the studies. Meanwhile, the United States Congress took only three years for its own inquiry to debunk any link. You know it’s bad when the U.S. Congress is running circles around the editorial board of one of the world’s most illustrious medical journals. Over the last couple of decades, multiple attempts to improve the quality of peer-review adjudication have disappointingly and largely failed to improve the situation. I am glad that people believe science is a concept worth marching for. But the reality is that the state of affairs within the scientific community and literacy among its “fans” lies largely in shambles. The March for Science, and the somewhat mindless glee that was on display, is entirely antithetical to the idea of science as a whole. For one thing, scientists are legendary flip-floppers. That’s actually a strength of genuine science, not a weakness. When the facts change, opinions must follow suit, not vice versa. 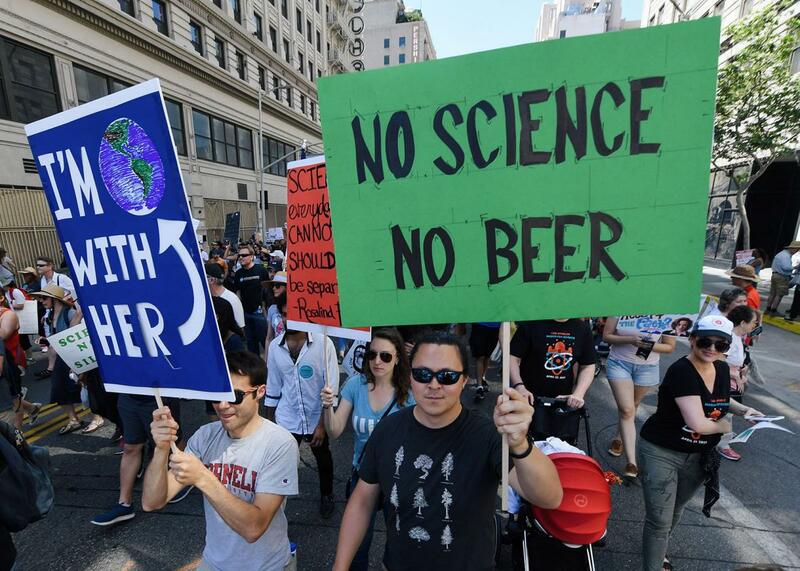 We need to work to fix the problems of poor research and science comprehension if we’re ever going to have a reasonable case against those who disparage science, and as the march showed, we still have plenty of work to do on this front. This does not render science deniers correct on any particular topic. Far from it. They indeed remain the primary enemy and are wrong on the issues a staggering majority of the time. But in the long run, the propagation of bad science that feels like good science—and the inability or unwillingness of well-meaning progressives to distinguish it from the truth—only strengthens the hand of the opposition.